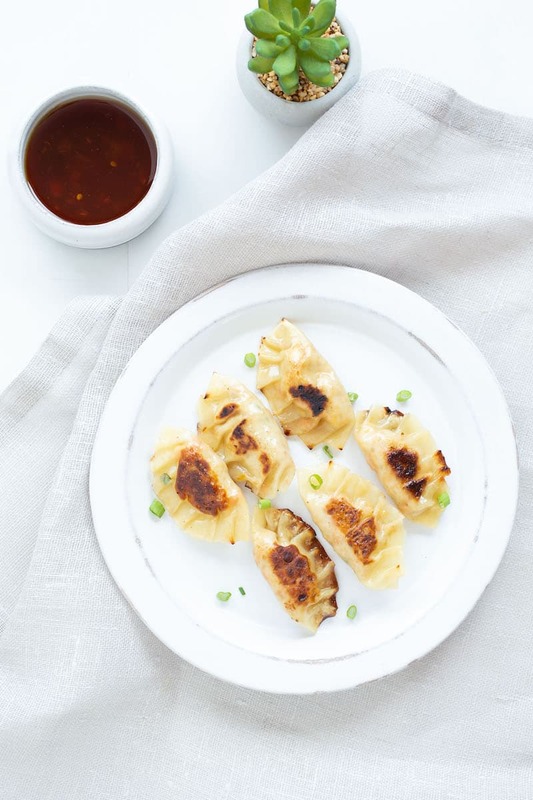 Homemade Tofu-Veggie Dumplings | Good. Food. Stories. As the ball dropped, calendar pages turned, and the East Coast ushered in 2014 last Tuesday night, we rung in the New Year with a blowout feast for the history books. Longtime readers know that the Boston New Year’s Eve party is a longstanding tradition. It’s so long, in fact, that on this go-round we not only celebrated the new year, but our 10th year of throwing the party together. And as befits such a milestone, we decided to honor the occasion with a special menu: a host of dishes from all nine preceding New Year’s parties as a look back at the moments we shared throughout the past decade of December 31sts. And I took the opportunity to revisit a nostalgic recipe that appeared once before on our 2006 New Year’s Eve menu—our third party together, a pan-Asian-inspired theme in honor of the Year of the Pig—but which has a history that stretches back much further. Despite the fact that this dish has no family provenance, no long and storied line of grandmothers passing it down to mothers passing it down to me, and no authentic background to speak of, it’s nonetheless a recipe I hold very dear. It’s baffling to consider how I might have been inspired to attempt something so ambitious for someone with so few kitchen skills. 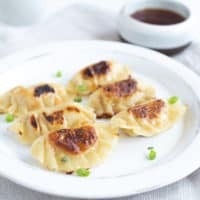 I can’t claim that any part of the recipe comes from any authoritative Asian tradition; though I’ve tweaked the formula oh so slightly over the years, it is essentially the same as it was when I started wrapping these dumplings at the beginning of the 21st century. The only certain change and improvement has come in my dumpling folding skills; no longer do they look like sad tortellini, but like real pleated beauties. I promise that with a little practice, your dumplings will look just as good. 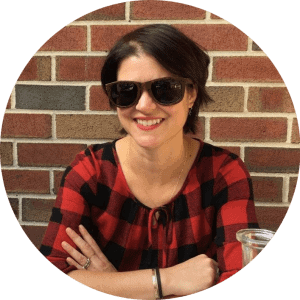 Though my initial assembly line setup was rudimentary—balancing bowls of filling and water on my computer desk, since I had no dining surface in my grad school dorm apartment—it’s much easier to sit at a big table and whip through a few dozen. Make a double batch and invite a few friends to help; the process goes quickly and you can catch up on Scandal while you fold. It’s fun and won’t take a whole year. Oh yeah, and the tofu thing? I usually refer to these simply as “veggie dumplings” when I’m serving them to large crowds. The extremely carnivorous and tofu-averse have never raised one peep of complaint. How could they, when they’re stuffing dumplings into their pieholes too quickly to talk? With your hands, crumble the block of tofu into small curd-like pieces in a medium bowl. Set aside. Heat 2 tablespoons of the oil in a large skillet over medium heat until shimmering. Add the carrot, scallions, garlic, and ginger to the pan and cook, stirring frequently, for 3-5 minutes until the vegetables have softened. Add the crumbled tofu and stir into the vegetables, using a silicone spatula or wooden spoon to further crumble the tofu into smaller chunks. The mixture should resemble fluffy but dry scrambled eggs. Cook for 3-5 minutes more to dry out the tofu. Stir in the soy sauce and sesame oil, and cook for a minute or two more to fully meld the flavors. Scrape the filling into a bowl and let cool to room temperature for 15 minutes. Line a large rimmed baking sheet with waxed paper and prepare an assembly station of a bowl of water, a teaspoon, a damp paper towel, and the bowl of cooled filling on a large, clean work surface. Place the damp paper towel over the reserved wrappers until needed. 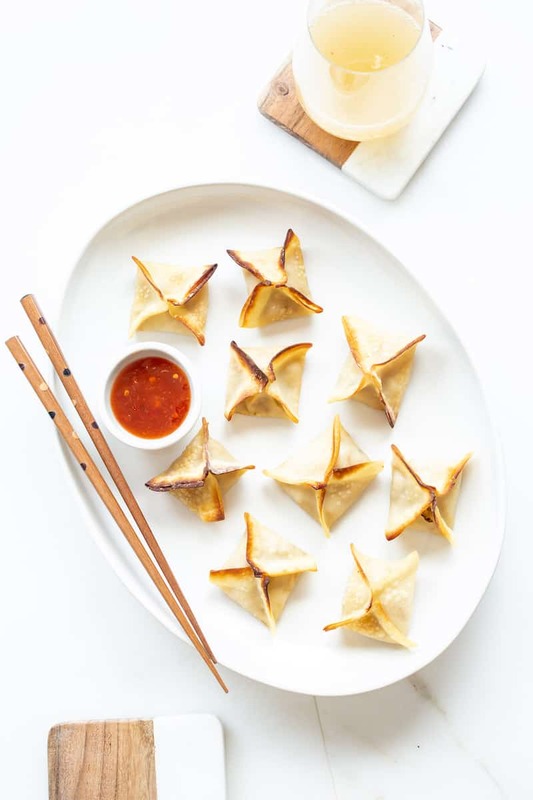 If using square wonton wrappers, slice off 2 opposite corners of wrapper. Place a heaping teaspoon of filling in the center of the wrapper. Wet your index finger in the bowl of water and use your finger to dampen the edges of the wrapper. Fold one sliced-off corner up to meet the other sliced-off corner, gently pinching them together to seal. You'll now have a loose front and back half of the wrapper that need to be connected. Create pleats by using your thumbs to make a fold to the right of the pinched center in the front half of the wrapper, pressing to adhere the fold to the wet back half of the wrapper. Make a second fold to the right of that fold to seal the entire right edge. 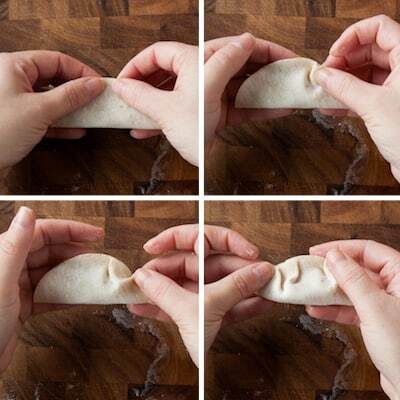 Repeat with two folds on the left edge of the wrapper until the dumpling is completely sealed. If the wrapper starts to crack or tear, just wet it gently with your finger to seal the tear. 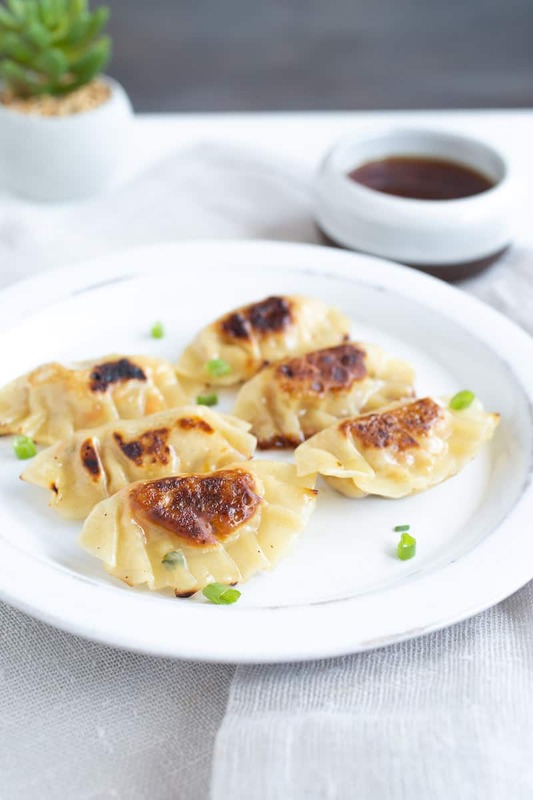 Place the finished dumpling on the prepared baking sheet and repeat with the remaining wrappers and filling. If not using immediately, freeze the dumplings on the baking sheet for at least an hour. Once completely solid, they can be transferred to a large zip-top bag for freezer storage up to 3 months. Or cover with a damp towel for up to 4 hours and follow the instructions below, reducing cook time by a few minutes. Bring two opposite corners of the wrapper up to meet one another and press them together to seal, then bring the remaining two corners of the wrapper up to meet that point and make a pocket. Press along the four edges of the pocket to seal completely. If the wrapper starts to crack or tear, just wet it gently with your finger to seal the tear. Preheat the oven to 400 degrees F and line a large baking sheet with parchment paper or a silicone liner. Lightly brush the frozen dumplings on all sides with canola or olive oil and place on the prepared baking sheet. Bake for 10-15 minutes, until the dumplings are crispy and golden brown. Serve immediately. Heat 1-2 tablespoons canola or olive oil in a large skillet that can comfortably fit a lid over medium-high heat until shimmering. Add the dumplings in a single layer and cook uncovered for 2-3 minutes to crisp the bottoms of the dumplings. Reduce the heat to medium. Add 3-4 tablespoons of water to the pan (or more, if you're able to cook more than 8 dumplings at a time in your skillet) and cover to steam the dumplings. Steam for 3-4 minutes, then carefully remove the lid, letting excess steam and condensation escape. Gently remove the dumplings and serve immediately.